Carolyn was delighted to organize and serve as one of the faculty members at the 2012 North American Systemic Constellations Intensive. The group that gathered included many seasoned Constellations professionals from around the globe as well as participants who were new to this work. The sold out event proved to be a rich experience for participants and faculty alike. Find out about the deep work as it occurred during the Intensive by reading Carolyn’s article, Including Alse - The Connecticut Witch Hunts. Carolyn was honored to serve as Co-Director of the highly successful Third US Constellations Conference. The conference had more than 50 speakers and attracted an international, sell out crowd of 300 participants. Along with providing opening statements each day, Carolyn served as one of the Faculty of theConstellations in Integrative Health Course. 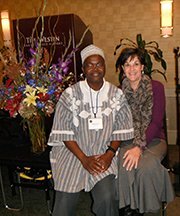 Carolyn also had the deep privilege of co-leading a workshop, Cosmology, Culture & Constellations, with Malidoma Somé, PhD. An internationally known teacher, speaker and elder from Burkina Faso, W. Africa, Malidoma also served the conference as a keynote speaker.